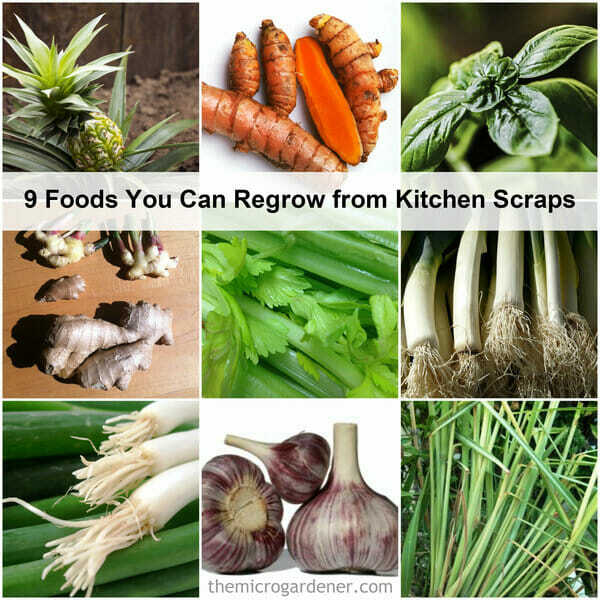 Turning ‘trash into treasure’ is one sure way to be thrifty in the garden. If you don’t have to buy a container, you can keep your money in your purse for plants or other garden supplies you really need to buy. Being creative with your hands and making attractive, affordable planters, potting benches and unique pots for other gardeners may also be a niche market to make money or raise funds for a worthy project. In our ‘throw away’ society, many people never stop to think about giving new life to an object that appears to be ready for the rubbish tip. Stop! 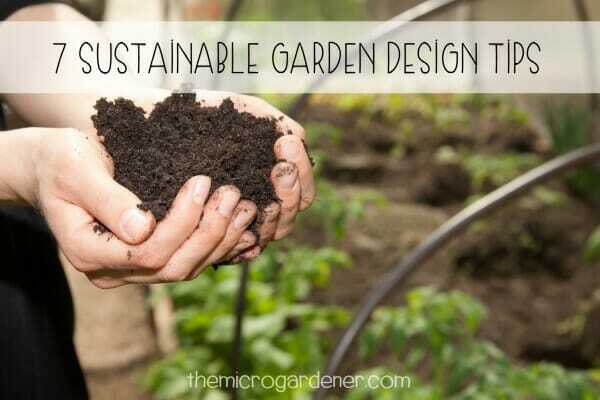 Think about the shape of the container and ask yourself ‘Can I add drainage holes?’ or ‘Can I use this as a cache pot?’ Large items in particular like BBQ trolleys, chairs and furniture take up a huge amount of space in landfill but can easily be turned into useful planters or potting benches. 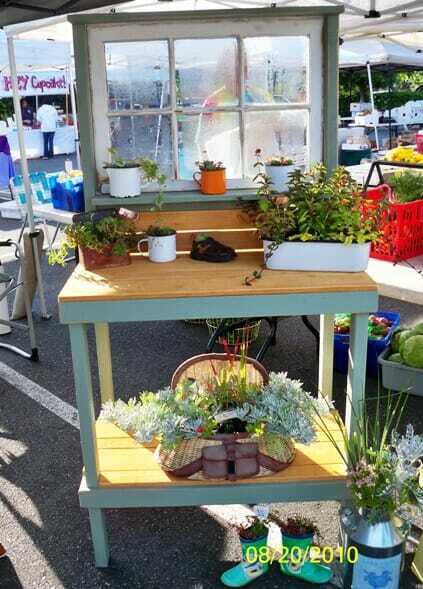 An old window frame has been repurposed with some other salvaged materials into this practical potting bench for the garden. Many people spend a lot of money to buy unique, one-off pieces at expensive garden centres and nurseries to decorate and add character to their garden. Frugal gardeners however, know you can achieve the same effect with a little creative thinking and often a splash of paint, polish or artistic flair! Add a little artistic flair in the garden by clever use of colour – 500ml sample paint pots have more than enough paint to cover several plant containers in matching colours at minimal cost. 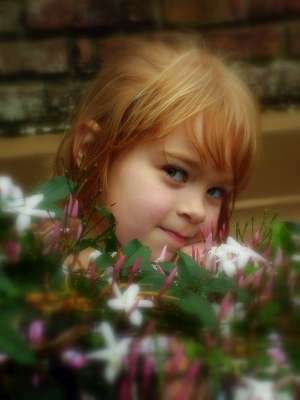 Think about what YOU love – and turn this into your personalised garden theme. Do you have a favourite colour? Like rustic farm or garden tools? Garden art? A particular plant species? 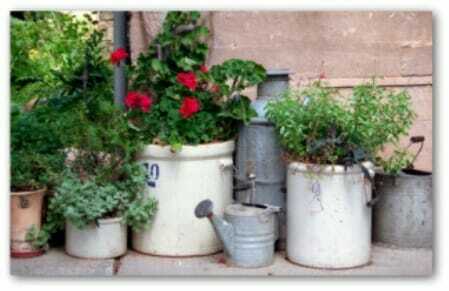 Do you have an old collection of unused items that could be turned into planters? Here a collection of old enamel and metal containers in silver and white have been grouped together and reused as planters with great effect. Once you decide what is missing in your garden, you can add a little creativity by incorporating your hobby, art, collection, favourite colour or plants into your garden space. Just start sorting out or collecting old items, going through your garage or attic, and saving objects you would have otherwise thrown away. 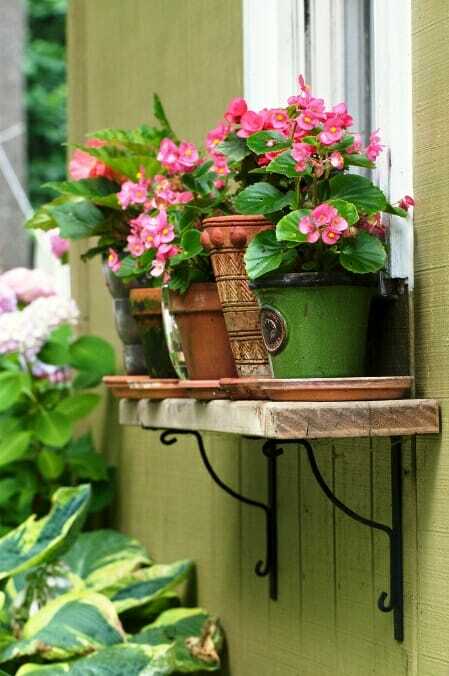 There are so many items that lend themselves to repurposed planters. If you’re cramped for space, growing ‘up’ with some clever repurposed space-savers is an ideal way to get more plants in your garden. For example, an old piece of lattice, a gate or shelf can be repurposed into useful wall or bracket-mounted hanging space for plants. An old piece of timber and a pair of brackets have been refashioned into a useful vertical growing space for pots. 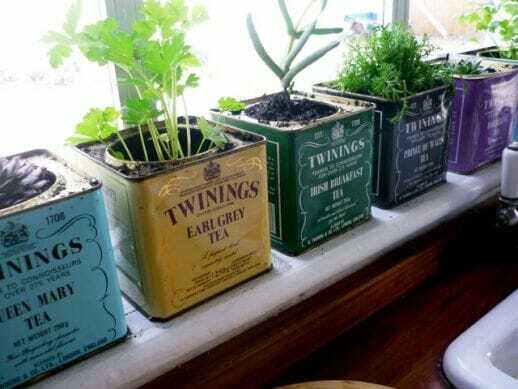 Some people find repurposing containers totally addictive! Making old things new or painting a mis-matched collection of items in the same colour can make you look like a pro garden designer with very little effort. It’s also a great way to make home-made gifts. There’s no better hand-made gift than to ‘give a garden’ in a repurposed planter. 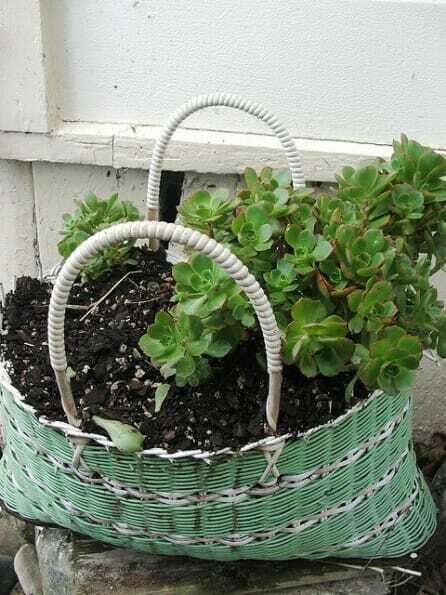 This basket has excellent drainage and makes a perfect partner for low-maintenance succulents. Kids thrive when given some creative space. 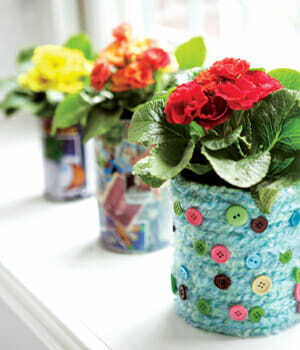 Give them the opportunity to make their own garden with the simplest of containers like old tin cans, shoes and toys. They’ll take to it like a duck to water. When they grow out of those gumboots or break a toy, give them the chance to re-purpose it into a new garden! Tin cans from the pantry would normally end up in the bin but can make cute flower pots or mini planters especially for children. A great craft project and a micro garden small enough for a windowsill. Make it their own exciting little project to work on. With a little paint, patience and imagination, children can invent their own ingenious ways to save resources and grow their own garden. Not everyone can picture what they can do with what they’ve got – so help them out! Invite friends, family and neighbours over to share your creative ideas and inspire them to get started on their own repurposed garden project. Find a friend – be inventive, share resources and go shopping at garage sales and op shops together. Many retired people have spare time and would love to share their skills and have a bit of company while making planters with others. Start a ‘Repurposed Garden Group’! Funky repurposed planters can be great fund-raisers too so think about opportunities to make something unique and raise money for your local school, community organisation or project. 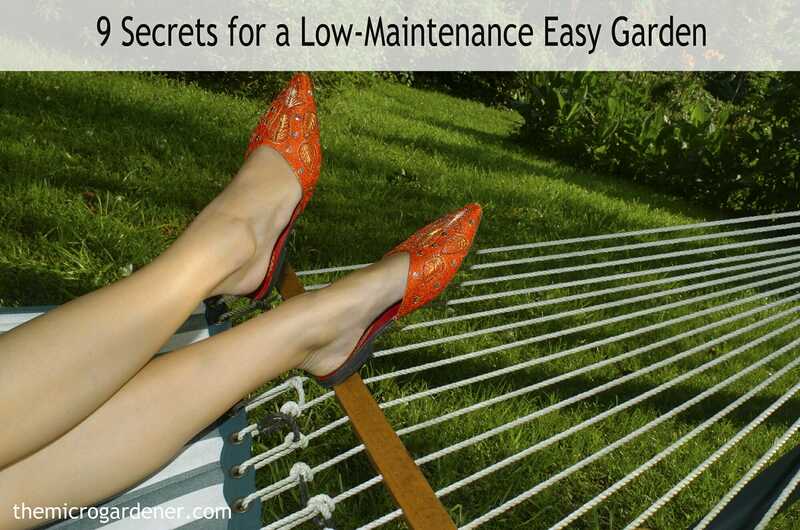 Many gardens, especially micro gardens fail to make the most of the space they have. They are often missing a special feature to draw the eye, become a focal point for the garden or even when looking from inside out. Put your artistic hat on, stand back from different angles and try to imagine what the space needs. Holding your hands out in front of you to make the shape of a miniature square ‘frame’ like a camera often helps! What can you see inside the ‘frame?’ Maybe a tall container is needed where everything else is low-growing. Perhaps a vertical ladder with plants on the rungs would draw the attention to a feature wall or an unusual container in the centre of the garden may become a conversation point. 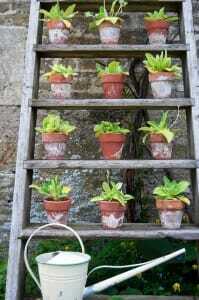 An old ladder may no longer be safe for human use but it may be perfect against a wall as a vertical garden feature. Have these ideas inspired you to start making your own repurposed planters? If so, please leave a comment, share your ideas and photos to show others what you’ve done. We can all learn from each other. 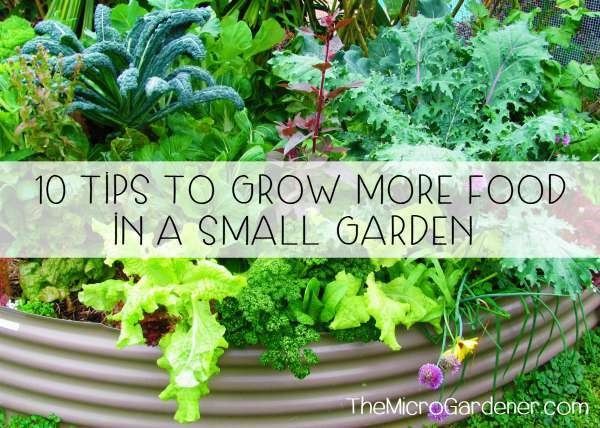 Check out other container ideas here and pick up some tips for growing container gardens. Want more photos and tips? Check out these clever plant container ideas, tips on frugal gardening, thrifty recycling ideas for the garden and more inspiring repurposed containers. I’m working on reusing tin cans (from soup and canned vegetables) as centerpieces for my wedding, and am looking for some nice flowers to plant in them. I love the flowers in #7, but don’t know what they are. Any help? And if you have any recommendations for short flowers to grow in pots, please send them my way! Right now we are looking at dwarf zinnias, marigolds, and pansies. Hi Katie. Not sure what #7 is sorry but other short flowers you might look at are violas/Johnny Jump Ups; lobelia; begonia; dianthus; some salvias (depending on the pot size); portulaca and alyssum/Sweet Alice. It also depends on the season so it might be best to chat to your local nursery and get some advice. Hope you have a wonderful wedding. I would absolutely LOVE to see/share some pics of your can planters with my readers to inspire others what they can do. Feel free to email me before/after your wedding. All the best with your plans.